Lifelike Decals third set of markings for the Ki-44 Shoki 48-038 offers four very interesting aircraft. First up is a Hei from the 23rd Sentai's 1st Chutai which was also illustrated in Osprey's Ki-44 Aces. A photograph of T/Sgt Yoshiji Okazaki standing in front of another Shoki from this unit suggests that it should probably have the front half of the spinner painted white. As part of the unit's "tokko" ramming flight WO Kobayashi's aircraft was probably unarmed with the cowling apertures faired over and possibly painted red. The second option on the sheet is for an 85th Sentai Shoki with unusual camouflage which has been featured in a Hasegawa kit. Here the Kana character on the tail has been depicted correctly as "Ha" (は) rather than the incorrect character included on the kit decals. 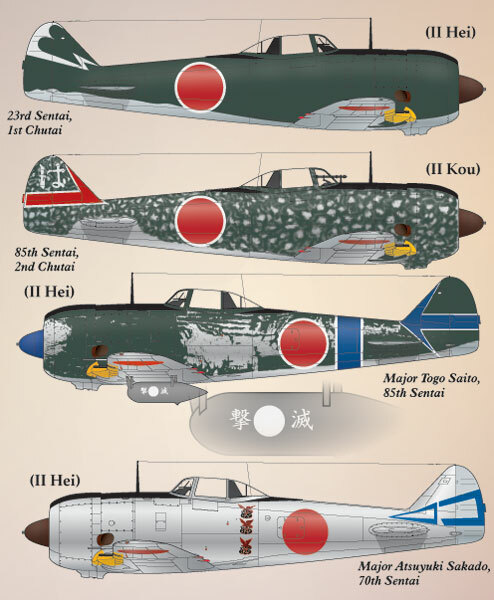 The third aircraft is very well known from previous profiles and kit decals, the 85th Sentai commander Major Togo Saito's aircraft. Although not profiled there are three photographs of this aircraft in Ki-44 Aces. It has been interpreted in various ways and Lifelike have chosen a plain, weathered dark green over natural metal whilst mentioning that it has also been depicted with green and brown camouflage on the upper surfaces. 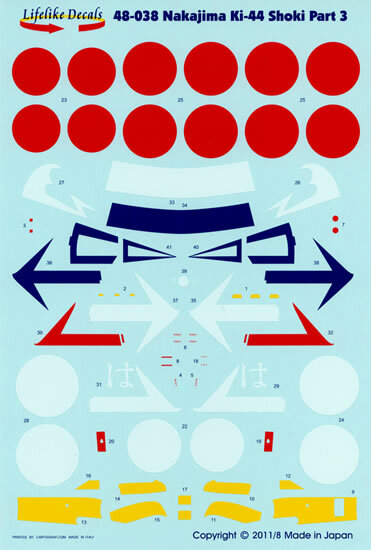 The distinctive Kanji characters painted on the drop tank represent "geki metsu"(撃滅) meaning to attack and destroy. The Sentai Hombu markings are cobalt blue and perhaps a little dark for my taste but they might look differently when applied. The colour shown on the profile in the sheet appears more typical. 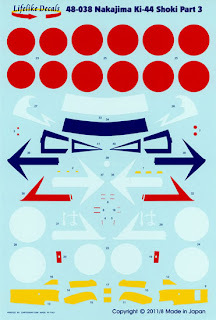 The last option is a real corker, the rarely illustrated Shoki of the 70th Sentai commander Major Atsuyuki Sakado with three distinctive B-29 victory markings and blue Sentai tail insignia; the same comment regarding the shade of blue, appearing rather dark on the decal but of more typical hue in the profile illustration. This is an unusual choice but a very attractive one, and would make a model a little different from the "herd". 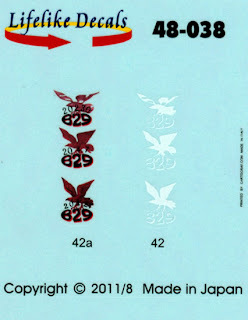 Another excellent Lifelike Decals set and again my wish is to see these available also in 1/72nd scale.